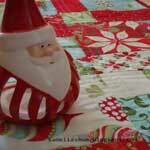 Sew a table runner for your Christmas table. Choose one of the patterns below to create a personalized table setting or use it as a lovely addition to an entry hall table. 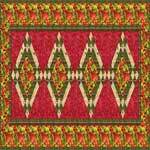 This is a Christmas table runner with deep colors of green, gold and burgundy to adorn your table setting. 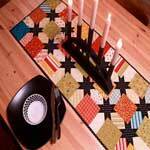 4 patchwork blocks make up this table runner. The blocks are 10 inches square. 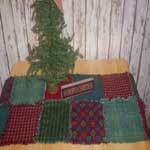 Here is a sweet raggedy one that has Christmas colors of cranberry and forest green. So easy! 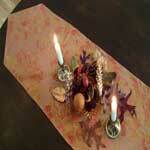 Easy to follow instructions for this holiday table runner. 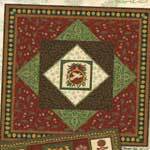 Create this red and white quilted star table runner using this detailed pattern with illustrative pictures. 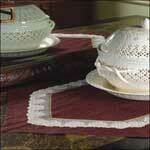 Dress up any table in the house this Christmas by making this elegant table runner that is also reversible. Add your own embellishments to fit your style. Busy with holiday shopping? 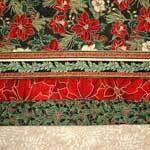 Use this Christmas table runner pattern and have a beautiful table setting in no time at all. 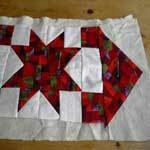 This is a great quilting project for the beginner. 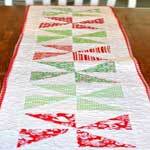 Create blocks by sewing squares of fabric together for a colorful Christmas patchwork runner. 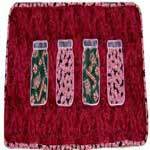 Here is an easy to make Christmas table runner with jars filled with candy canes, ribbon candy and peppermints. 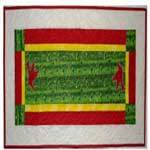 Colorful pinwheels of red, green and white line up to make a charming table runner for your home. If your taste leans towards the warm and charming country style this one with 37 charms is for you. 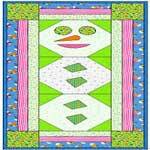 This detailed pattern is for a 20 x 40 inch table runner of a snowman with a carrot for a nose. So easy and so cute. Create an elegant Christmas table decoration in vibrant holiday colors with a dove on each end to add to your Christmas decor.